The Egyptian capital of Cairo is a backpacker’s delight. With sights ranging from as old as 4500 years back till the teeming souks of downtown, Cairo offers delight to every visitor. Travel to Cairo and experience the beauty in journey. Here are few of the places that may make a trip to Cairo seem like a time travel odyssey. Pyramids of GizaOn the borders of the Sahara Desert and the Nile Valley sits one of the famous wonders of the world- The Great Pyramids of Giza. The Pyramids of Giza is 4500 years old and still is as striking as ever. 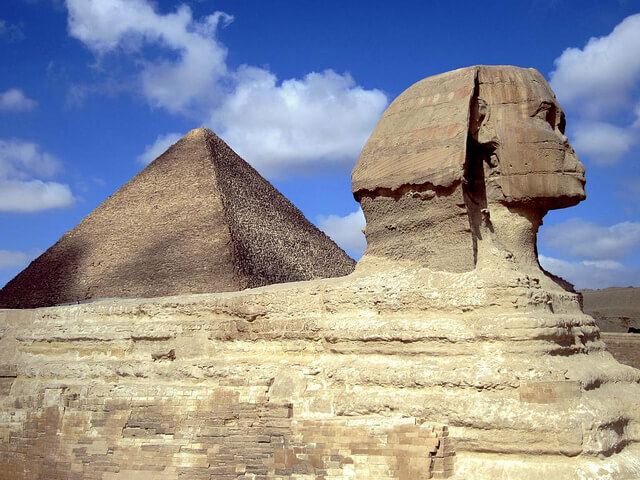 On the entrance of the Great Pyramids sit another famous figure- the Sphynx which is one of the most important mythical creatures belonging to the folk lore of the land. This mythical creature is seemingly a half man- half lion figure which is believed to be the guardian of the Sun Temple. Situated in Mida Tahrir, the city center of Cairo, is the Egyptian museum which houses irreplaceable artifacts from the various ages of the elaborate and illustrious Egyptian history. One day is not enough to go through all that is exhibited. The most famous exhibits include King Tutankhamen’s golden mask, the famous Pharaoh’s coffin, mummies etc. History is captured here in The Egyptian Museum. Situated at a distance from the Egyptian museum, the Citadel and Mosque of Al Pasha is a fortress built around the Ottoman style of architecture. The top of Mount Mokattam, the Citadel is a place built against a backdrop of beauteous landscape. No visit to Cairo is complete without a visit to the market or ‘Souk’. The Khan El Khalili is the busiest and most sought after market in Cairo. Be sure to find curios and wonderful artifacts and gorge on local delicacies here. Coptic Cairo is reminiscent of Egypt from the time Christianity was first introduced in Egypt. The place is dotted with numerous grand churches. St. Georges Church is the largest among them and St. Sergius Church is the oldest.. A valuable collection of ancient Coptic art is exhibited in the Coptic Museum. Travel to Cairo and experience the beauty in journey. Here's a list of places that may make a trip to Cairo seem like a time travel odyssey.